Last week, in a fit of simplifying and a leap of faith, I threw away my topo maps. Maps that had been carefully selected and bought, one by one across the many years; each one lovingly trimmed by my own hand, labeled in ballpoint around the margins, individually indexed – representing 30 years of precious family memories in Montana and elsewhere. Every one of my 7.5-minute quads for Beaverhead County, all my 30×60′s, the old 15-minutes, and every 1:250,000-series covering the state. I couldn’t help but count them: 440 maps in all! To buy them again would cost 440 x $6 = $2,640. Not mentioning the work of labeling, folding, and filing. Needless to say, I was aswirl with emotions – nostalgia of course, the sadness of saying goodbye to friends, but also mixed up with that an excitement of jettisoning weight. Freedom. Often it’s true, it’s the things we used to love the most, which need to go. "Right now, in standard orienteering, you hold your GPS in one hand, about the size of a smartphone, and your map in the other hand. The devices are too cramped for map reading. That’s why GPS people are so fascinated by gridlines on maps, they sync their gadget with their paper, by brute force. When the map and the GPS merge and become inseparable in one device, that’s going to be fundamentally different. About one full order of magnitude different." Since then of course, long story short, I purchased such a device (Flaco, see last post) and learned how to use it. For me and my purposes, the thing has been worth every penny. I use it in sun and in rain, hiking, camping or driving, anyplace I formerly carried my topos. The point of this post is not to go over specifics of how to use such a device in orienteering. Nor is it to convince anybody of anything. I won’t talk about the pros & cons of GPS-enabled tablets versus a dedicated GPS, or paper. All of that fine-grained detail would come naturally for you, as it did for me, if you decide to try one of these. They are expensive; mine cost $700. Of course they are used for lots else besides maps. There’s a lot to consider. All I really want to report, today, is that for me – speaking as a lifelong fanatical lover of topos – Flaco works better, in actual field use. Enough so, that I can already be confident I won’t use paper topos any more. PS: It wasn’t strictly accurate to say I threw my topos away (dramatic effect); actually I threw them in a big box, because my daughter Addie wants to take them. She’s a distance hiker; Laura & I only do daytrips now. Paper still makes better sense multi-day, especially if you inherit an heirloom collection of maps, simply due to the weight and hassle of recharging batteries. In the future I see a device dedicated just to maps, using digital paper instead of an LCD. Like Kindle + GPS. It would be lighter, use very little battery, and read crisply in sunlight. PPS: I said I would skip the nitty-gritty. But very quickly in case you’re curious – the three apps I use are Google Earth, Google Maps, and Backcountry Navigator. All three zoom and pan the same way with two fingers, and all three indicate location within 3-10 meters with a blue dot or arrow. The GPS antenna works fine with all radios off in Airplane Mode away from regular coverage. Batteries last good all day. Some pros & cons: Flaco is murkier to read in bright sun. But the ability to zoom and pan seamlessly at all scales, and the ease of selecting any desired chunk of country to download when you still have internet, make up for that. Caching topos is straightforward, but it’s also easy using some trickery to cache imagery in Google Earth, and 10 x 10 mile pre-caches in Google Maps. A simple compass is still quite useful. We tend to read the device only during breaks, or at confusing trail junctures. I used to carry a paper map in my right hand all the time, following landmarks while I walked. The blue dot makes up for that. BLM & FS boundaries can be bought as a layer for $20/state, a bargain. Here are some moments I particularly savored: 1) Driving in total darkness on weird branching gravel roads across Idaho lava fields, until my little blue dot was safely inside BLM, then making a nice camp there by headlamp. 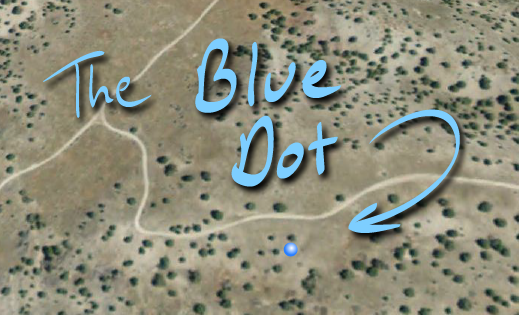 2) Near the end of a long hike, seeing our blue dot, seeing where our camper was parked, then suddenly seeing a straight bushwhack back. Saving mindless trudging. Plus, prettier. Wouldn’t have seen this route without the blue dot. 3) Walking straight through dank and level trackless trees, glancing now and then at our blue dot, then emerging in a perfect open meadow on the map. 4) Easily knowing how many feet we climbed since last break, how many feet to the top, no need for an altimeter. 5) Cursing the typical thing where roads on the topo are making no sense, then remembering… Satellite view! Suddenly all the roads, exact and perfect, the strong bright ones, the subtle side branches, the tracks that shouldn’t even be there, just as they photographed straight overhead a year ago. 6) Lastly, the title screenshot for this post represents an actual case of me, sitting in my lawn chair in the shade of a juniper, looking at my own blue dot and realizing, hey, that’s really me, because that’s my exact juniper, and there’s that other fat healthy one, right across the road! What’s next for me? I want to get comfortable with KML/KMZ. All of our favorite hikes are impossible to describe in words, they only make sense as a path on a map because we are usually off-trail. It would be fun to share some of these favorites with friends as little e-mailable KML paths. It would be fun, too, to plan a new route sitting on the couch, save it as a simple path, then run it out in real life when the weekend rolls around. KML would also be good for organizing placemarks as you learn where the useful stores and services are, on city maps.